Fernando Alonso has been accused of sour grapes after his less than enthusiastic remarks regarding team mate Nelsinho Piquet's performance in the Hockenheim GP. He points out, quite correctly, that Piquet's second place owed far more to luck in pitting just before the safety car period than to any great skill in his driving. The problem for F1 fans has been that Alonso appears not to have congratulated Nelsinho, surely the least that might be expected of a team mate, although there are reports that he sent an SMS message. Whilst it is true that Piquet's pit stop could not have been better timed, it is also a fact that he drove well enough to keep Massa behind him in the closing stages. That was worrying enough for Ferrari for the team to have "summit meetings" afterwards and it clearly hurt their pride to be beaten by Renault; Piquet deserves credit for that, at least. So I agree that Alonso is showing his usual petulance at being beaten but that is understandable, even so. Flavio Briatore was reported to be quite critical of the Spaniard's performance after the race and I think that was very unfair. Consider what Alonso achieved that weekend. He qualified the Renault ahead of both BMWs, Red Bulls and one Ferrari, fifth spot being well above what the car should have been capable of. The bare statistics may state that he then dropped down the order to finish in eleventh but that is only half of the story. In the race Alonso was very competitive and made several passing attempts on the drivers around him; as luck would have it, every attempt was fouled up by one thing or another and resulted in him being passed himself. The point is that he was trying, however, and was quick enough to compete with the Toyotas and BMWs. That is the thing about Alonso and the reason why Honda have to be interested in him: he is both talented and a racer, no matter how miserable he can be after losing. He has looked ragged this season but that is only because he is having to drive at the very limit to stay with the competition. Renault is getting its money's worth from him. As for Nelsinho, I doubt he will be too concerned by Alonso's bad grace. He knows how much his podium position owed to circumstance and will not let it go to his head. After his apparently arrogant statements last year, he has had to learn humility in double quick time. That will help enormously in his development as a person and might well assist in turning him into a strong F1 driver too. 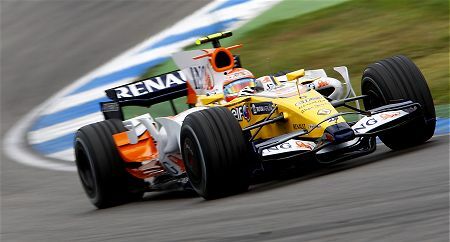 I notice, too, that doubts are now being expressed about Alonso's ability to set up the car; there was even mention that he borrowed aspects of Piquet's settings for the race in Hockenheim. That surely illustrates the fickleness of the media, so certain were they that Hamilton benefited from Alonso's settings last year; yet now Lewis is the class of the field without any assistance from Fernando. As Steven Roy often points out, each driver has his own style and will prefer some aspects of handling over others - seeing a team mate's settings might occasionally give a clue as to why they are quicker at some point in the circuit but only a fool would transfer the whole thing to his own car. Standard stuff from Alonso really - he said much the same after Giancarlo Fisichella won at Melbourne in 2005, and when Lewis Hamilton won at Montreal in 2007. On both those occasions it was entirely legitimate to claim those drivers had been fortunate - Fisichella much more so than Hamilton, as the Italian had profitted enormously from a part-wet qualifying session that weekend. But the fact that Alonso feels the need to point it out and not just let his young team mate have his moment in the sun, after he's spent all year thrashing him, hints at the insecurity in Alonso we saw all too plainly exposed last year. Agreed, Keith, Alonso is all too prone to tantrums when things do not go his way. It does stem from an urge to be best, however, and almost forgivable when he gives one of his displays of sublime ability in a racing car. Flavio has had to put up with more than a few bouts of petulance from his favorite, so I'm just a little surprised if he is genuinely disillusioned at this stage. If F1 allowed one car teams and for the driver to turn up and drive Alonso would be fabulous. In a car the guy is dynamite but amazingly he seems to have learned little of the other responsibilities of his role. He made it plain enough at the end of last season that he wanted to be the clear number one driver in a team but there is more to being undisputed number one than turning up and driving. I have never been a Michael Scumacher fan but where he did gain my respect was in the early times at Ferrari. The car was rubbish and the team a disorganised mess but not once did he publicly criticise them. I have no doubt in private he made his point of view very clear but in public it was all about how 'we' are building a team and how 'we' will work to sort the problems. Alonso for all his ability and success and the fact that presumably like the rest of us he watched Schumacher operating seems either not to realise his responsibilities or is simply unable to perform them. It is beyond my comprehension that Honda are considering replacing the hard working, popular and savvy Rubens Barrichello with a driver who will do nothing to help build the team and will throw his toys out of the pram if Button does not suitably respect his position. In the car Fernando will demonstrate its full potential in a way that neither Button nor Barrichello can but what is the point in knowing that your car is two-tenths of a second faster than you previously thought if you are still on the back third of the grid and you have replaced a vastly experienced and capable development driver who has a rapport with your resident technical genius and a good working relationship with his team mate with someone who is stomping around like a two year old in a temper tantrum. I think Jenson Button is massively over-rated in some quarters and the idea that he would match Lewis in a McLaren is laughable but if I was running Honda I would rather have Rubens and Jenson working together to improve things that Fernando Alonso potentially causing problems. In Autosport's recent assessment of driver performance over the first half of the season the most evenly performing team mates on the grid are Jenson and Rubens and no-one is going to suggest Rubens could match Lewis. If Ross Brawn manages to point Honda in the right direction and in a couple of years they are in the same position BMW were at the begining of 2007 then Alonso's performance in the car would be worth the risk. Jonathan Palmer once said that overtaking was all about balancing the risk against the potential gain and I believe this equation can be applied to many things. Is the risk of Alonso de-stabilising the team worth the potential gain of having him in the car? Gawd- I go on holidays for 2 weeks and it all happens in my absence ! Piquet on the podium - who woulda thunk it? And yes, before you state the obvious I WAS in a place where there was no TV or internet coverage. Anyone know of any sites where I can download the race? There's nothing unusual here - Flavio has a habit of randomly telling off everyone if something goes bad, and Alonso has a habit of sulking if his team-mate beats him. Expect more trouble ahead if this turns out to be a proper Piquet Jr blossoming. Steven, I think Honda's interest in Alonso (if true) is more of a negotiating tactic than anything else; it means they can pressure Rubens to accept less money to continue than he would otherwise. There's no good reason (only marketing reasons) why Alonso would be better than Barrichello in that team. Pink Peril, stick "2008 German Grand Prix download" (without the quote marks) into a search engine. I shouldn't really have told you that, but that search should tell you which sites have it available at any given time (the FOM may miss most of them, but sometimes it strikes sites without notice). Wow, interesting stuff! I learn something new every day - and I'd never have guessed the reload trick, Becken. Thanks. Don't tell Bernie, anyone!